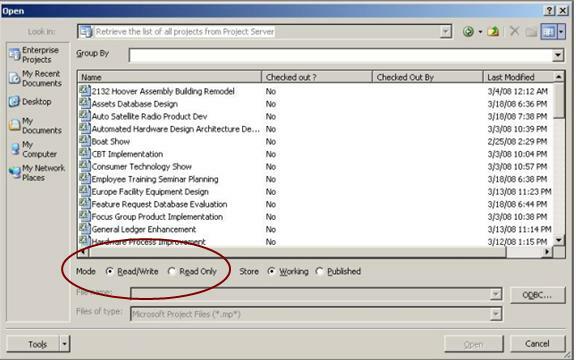 You can optionally use Group by option to apply the grouping to the projects listed in Open dialog box. 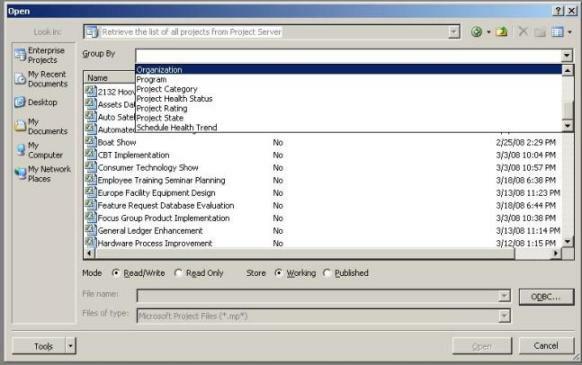 If you want to group the projects list, click the Group By dropdown and select a enterprise custom field from the list. 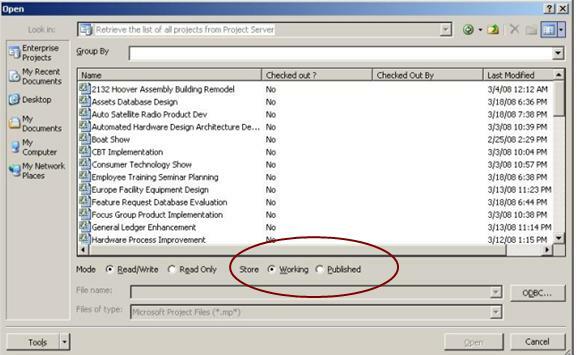 NOTE: To group the projects, you should use Retrieve the list of all projects from Project Server option on File -> Open menu. Group By option doesn�t work for local cache projects. View option is similar to viewing the files in windows explorer. 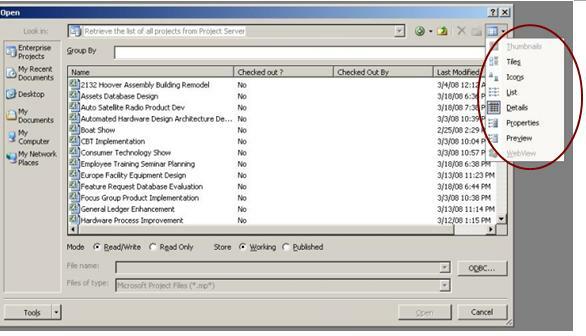 By clicking the list icon in the upper right corner of the dialog box, you will see the various options to display the projects lists in dialog box. On Open dialog box, you will see there are two Mode options. Choose the appropriate option to open the project. Working: Working version of project will contain all the latest changes you made to the project plan. To edit the project plan, you have to select the project by choosing the mode Working. Published: To view the Published version of the project, you must select project name from Open dialog box and click on �Published�. Project Server opens the published version of the project in Read-Only and will not allow you to edit the project. NOTE: Working version of project may be different from Published version of a project. The reason for this, if you performed the changes to the enterprise project plan but have not yet published the changes to the project server.